Teachers, if you were thinking of bringing up the New York Times website in your classroom today, I suggest you think twice. Here’s what your students will see. The video begins playing automatically. The still shot shows a woman, scantily clad, of course, and held hostage by a gunman. The video shows gunmen, military attacks, people drinking and women’s body parts. This comes up without any action by the reader. You can scroll over the video if you want the sound. Another way to ensure that extreme violence and sexualized violence finds a comfortable place in mainstream media. Very disappointing, New York Times. Utterly appalling that this would make the front page of a mainstream newspaper. I hope they get lots of feedback and I'll be adding my voice to the protest. 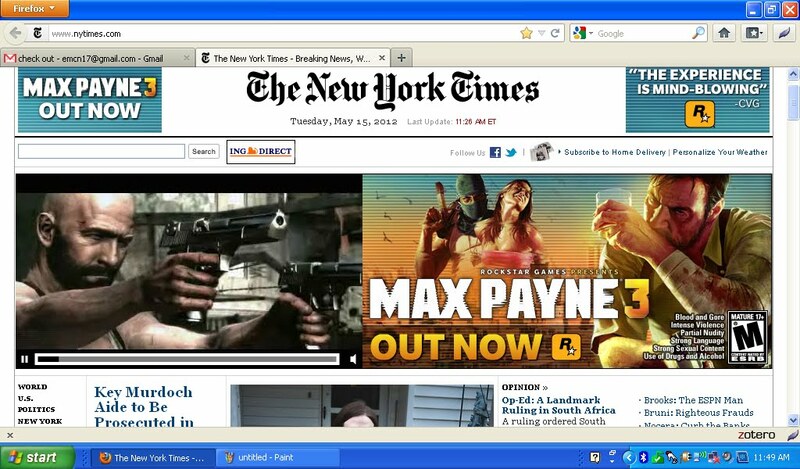 Last time I ever use NY times in my classroom. I would lose my job if I showed this kind of junk. Thanks NY times, will send my lawyer to see you should I get sued and lose my job!